As we move towards making India a Knowledge-based Economy, a fundamental area to address is the current State of Indian Education System. In the current status of Indian education, a striking pattern emerges in the form of the lack of curriculum relevance to students. As a result, classroom learning has been taking place on a very superficial level, leaving students unaware of the connection between classroom material and the practical realties. Indian education in its current state does not sufficiently address identity and self-awareness in relation to academic disciplines. Amid the assortment of variables that contribute to the problems plaguing the Indian educational system are the gulf between urban and rural populations and class and caste distinctions. With 35 per cent of the population under the age of 15, India’s education system faces numerous challenges. Successive governments have pledged to increase spending on education to 6 per cent of GDP, but actual spending has hovered around 4 per cent for the last few years. In which a teacher would dictate his notes word for word while students would copy it religiously; in such a scenario there is no interaction among the student and teacher. It is just a mechanical exercise by the students which does not cause learning. Interactive education is the ideal and practical way of learning but rote learning is projected and accepted as the ideal way of learning and the question papers are set to test memory rather than clarity of the basic concepts. Teacher will ask all essay based open ended questions whereas students have to answer in 1000-1500 words. It is not precise knowledge test mechanism. The source of most evil in the Indian education system is the marks based method of evaluation. Is it justified that a student is evaluated only on the basis of his/her performance for the duration of three hours of the exam? The student’s effort is fixated on gaining marks, as it is supposed to secure future prosperity; therefore there is less focus on applicatory learning and attaining excellence in subject matter. It means all that matters is marks and not the critical analysis or remarks. This markophobia has led many students to commit suicide. Only medicine and engineering fields are made the focus, while other diverse fields of arts and social science are also equally important to shape society and uplift economy. In fact the interest and orientation of student matters the most for work satisfaction. The colonial masters introduced education systems in India to create clerks and civil servants, and we have not deviated much from that pattern till today. If once, the youngsters prepared en masse for civil services and bank officers exams, they now prepare to become engineers and doctors. It is projected that tuition classes are inevitable for scoring good marks; this leads to undermining the zeal of attending school and adds to the cost of learning. National Knowledge commission rightly pointed out in one of its reports that if we fail to stop this parallel money making tuition business of education, then our efforts for imparting impartial and quality education will not be fulfilled. Education has become more of money making scheme and less of commitment to society as a result the entire education system is pushed to make profits. Knowingly or unknowingly, the complete system is desensitized to the original purpose of education. Money cannot fill the gap of wisdom, concern, altruism and sincerity that is the foundation of a stable and prosperous society. The entire economic or ecological crisis on earth is the outcome of selfish money making attitude and therefore academic curriculum must inculcate study of moral science. “The worst part of Career orientation happens at school levels and college levels lies in the very definition of a good career .A good career is presumably defined as “any profession in which you can earn more money is a career is better than the others. This resulted in a social change that percentage of selfish money minded people are growing and the actual contributors for the societal progress are shrinking. Well you want any evidence, you may not find its statistics but have a look at all the global crisis, environmental problems, economic partiality, etc. everything is the result of a selfish society of people”. Memory fades but not the skill as it is a life time asset, so education must focus upon imparting skills along with knowledge. If the criterion of grading and marking is shifted to classroom participation, project work, communication and leadership skills and extracurricular performance, only then will a genuine student shine out. This might sound like a utopian proposition but the Indian education system badly needs to bring about this change. Government has tried to build up independent vocational university but the proposal has not been taken seriously by the established universities. Instead of evaluating upon marks or numbers or memory feats, our testing and marking systems need to be built to recognize original contributions, in form of creativity, problem solving, valuable original research and innovation. If we could do this successfully Indian education system would have changed overnight. Memorising is no learning; the biggest flaw in our education system is perhaps that it incentivizes memorizing above originality. 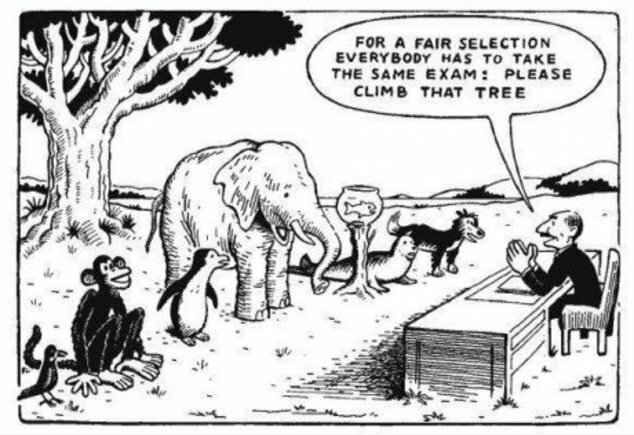 Thus the marks based exam system must be transformed into a pragmatic education system. School education must be made more relevant to the lives of students. There is need to move away from rote learning to understanding concepts, developing good comprehension and communication skills. This will happen when we change evaluation system. The academic curriculum must be framed to incorporate both ideas and its application. Teachers must be trained to teach application of knowledge. Resolve must be to be a good teacher, which automatically will make one a well-paid teacher. Teachers training institutes should be checked for quality and these institutes should be supported by government to have full time trainers with research abilities. Internet or on line education can spread education in remote villages or technology can make acquisition of knowledge easier. Today top universities worldwide are taking various courses online, and today you can easily attend a live class taught by a top professor of Harvard University online if you want, no matter which country is belong to. This is the future; this is the easy way to universalize education. ICT (Information & Communication Technology) is very important for Indian educational institutes to minimise the lack of trained man power in teaching learning process. Government has pouring crores of rupees on ICT but institutes are reluctant to learn and use technology as they lack experimentation and learning potential in teachers. The academics must stop undermining scope of other options by overemphasizing only particular streams. Institutions must have measures to evaluate the orientation and field of interest of students and guide them accordingly by career counselling. This will lead to breeding students with various talents to establish a balanced economy and society. India’s curriculum gives preference or rates high the study of engineering and science rather than subject of arts and social science. In Canada or USA, student can combine science subjects with arts, like computers with economics. It means short terms skilled courses must be combined with arts, science or commerce subject, this will encourage to explore fields other than medicine and engineering. Different potentials in students have to be recognized and encouraged so that each contributes his excellence to the society. Today we have only three clear cut streams in Indian institutes namely Arts, Science and Commerce and one cannot choose medicine with one political science subject or there is no chance that one can take languages with medicine. The Survey questioned the students on various aspects of their experiences at school. those who expressed a criticism), followed by the excessively bookish method of teaching and the lack of practical applicability (14%), and the lack of values (11%). Mother-tongue medium, pointing to a high level of dissatisfaction for that medium among its users. Another question brought out that 13% of students cannot read their mother tongue, and 18% cannot write in it. Competition: Even though 64% of the students found competition beneficial, 43% felt that the examination system is stressful. This leads to suicidal tendencies among students because they fail to cope up with education. Textbooks: 62% found the load of textbooks to be carried to school unnecessary and excessive. education, 35% reported being under pressure to get marks. Physical training: 70% of the students found physical training a pleasant change, but 31% of them found it insufficient. Most schools had some physical activity once a week, but many had it just once a month, or even less. Eco-awareness: About half of the students reported participating in the planting of saplings or cleanup programmes, but only 26% were taken on visits to Nature spots. 67% desired a green area in or around their school. Our education system is still a colonial education system geared towards generating babus and pen-pushers under the newly acquired skin of modernity. We may have the most number of engineering graduates in the world, but that certainly has not translated into much technological innovation here. Rather, we are busy running the call centres of the rest of the world – that is where our engineering skills end. The goal of our new education system should be to create entrepreneurs, innovators, artists, scientists, thinkers and writers who can establish the foundation of knowledge based economy rather than the low-quality service provider nation that we are turning into. Here I find it useful to share one of my experiment with engineering graduate. He has done mechanical degree and working in a reputed govt. agency as an engineer. Once he was with me and my bike fails to start after lot of efforts and I was helpless. I requested him to look into the problem. He said that he will make a nice diagram of how bike engine is working and the method through which petrol is running the vehicle but could not help you to start your bike. Then I call one bike mechanic to help me. In a couple of minutes he easily located the problem and soon my bike was start. I asked his qualification and found that he was just 8th class pass. Here lies a real problem. An engineering graduate is not competent enough to learn skills and an uneducated drop out is with skills but without proper qualification.When farmers in the villages of Punjab make a vehicle from the diesel engine and name it Maruta (A male version of Maruti), that is innovation. When villagers of the Rajasthan and Gujarat transform the Bike ‘Enfield Bullet’ into a local auto-rickshaw that is creativity. How many automobile engineering students could do likewise? The question is, how many? In a nutshell there is a need to change overall system of education in India if we want our nation to progress in line with the developed countries. It is the need of an hour to redefine education policies, philosophy of education and make it more practical oriented then theoretical. Hope for better in next coming years if we learn lessons from past mistakes. Efforts should be in the process to prevent education from being a commercial entity and to ensure government efforts reach the most remote areas of our country. It!Ð°Ð?Ð°Â?s truly a nice and helpful piece of info. I am glad that you just shared this useful info with us. Please stay us informed like this. Thanks for sharing.